Урок англійської мови в 1-му класі "Rainbow Lesson"
Practice using colors in active vocabulary of the learners through completing tasks in pairs, groups, whole class. -Let`s play a game! I`ll throw each of you the ball and ask: “What`s your name?” and your task will be to tell your first name. Let`s try: “What`s your name? – I`m _______” . Ok. Great! - Well, my dear, we are having a guest in our class and he doesn`t know you. Let`s help him to know us better (the teacher puts on the hand a puppet toy “Mister Froggy” and demonstrates the learners the example ‘speaking’ as a toy and replying for toy`s questions: “What`s your name? – I`m _______”). 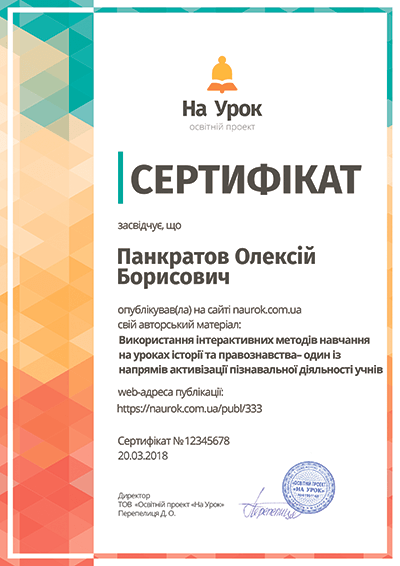 -Well done! Now our Mister Froggy knows everyone! Look, children, Mister Froggy brought us colorful cards. He told me secretly that he dreams to become teacher and he wants to try. Will we help him? Certainly! Mister Froggy wants to teach you how to name different colors in English. I`ll assist him. Look at the card, listen attentively to your new teacher and repeat after him altogether (the teacher shows flashcards with different colors, names the color and leaners repeat for 3-5 times). -Wonderful! Mister Froggy also prepared you some rhymes. Listen to them and complete when Froggy will stop. Вправно бігати люблю я у джинсах кольору _____ (blue). У Катрусі бантик зник. Був рожевим бантик - _____ (pink). Вранці ти не забувай чистити зубки кольору _____ (white). А лимон, коли він зрілий, одягає колір _____ (yellow) … etc. -Thank you. Mister Froggy is very glad. He is very pleased with you and your work. Now let`s play a game. (the teacher sticks colorful cards on the board). Stand up, please. We`ll make two groups. I`ll name the color and your task will be to reach the board as quickly and carefully as possible and to stamp the announced color with the help of these toy-hammer. Then you come back to your group and pass the turn to the other student. I`ll watch the score. Let`s try first. -Thanks .Take your seats, please. I also have something interesting for you. Look! This is a magic box. There is something inside it. I will show you the things and ask you, children, about its color: “What color is ____?” and will answer: “It`s _______”. For example,… (the teacher role-pays with a puppet-toy). Now you please. -Ok. And again we need two groups. I will show you a thing from the box. One group will ask the other :”What color is _____?”. And another one will have to reply: ”It`s _____ ”. Then you will exchange your roles. -Take your seats and work in pairs. Ask and answer about the color of any thing on your desk . -Very nice. You worked hard and it`s time to relax and to listen to a pleasant “Rainbow song”. https://www.youtube.com/watch?v=Gvjn-Se37Os Try to sing, too. -Mister Froggy likes you very much, guys. And what about you? Did you like Mister Froggy? What did you like about him most of all? What did you like about the lesson more? Did you learn anything new and interesting? What was that? Can you name the colors in English? How to ask about the color in English? And how to answer the question? Before saying you “good bye”, Froggy wants to present you something. They are coloring worksheets. Look, there are numbers on the picture. Each number is a certain color. 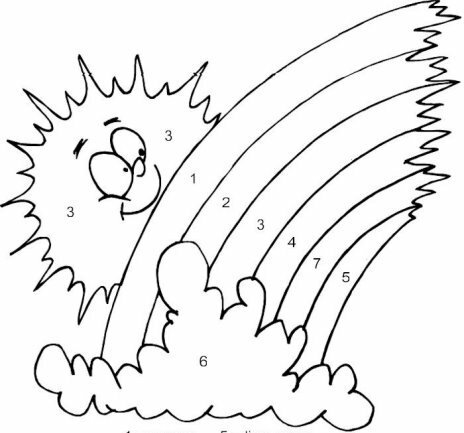 Number 1 is orange, number 2 is pink, number 3 is yellow, number 4 is blue, number 5 is green, number 6 is white, and number 7 is red. You can take your crayons and color the rainbow now.